JAKARTA / MUMBAI — At a bustling mall in central Jakarta, a new line of lipsticks, eyeshadows, and foundations has emerged alongside well-known brands such as Revlon and Maybelline. Unilever debuted Lakme, its first makeup brand in Muslim majority Indonesia, promoting bold colors that last through the night. The Anglo-Dutch consumer goods giant created a buzz for its launch event in mid-September by bringing Kim Kardashian’s makeup artist to Jakarta. Few people will notice that Lakme is a brand developed in India. The legend goes that, in 1952, India’s first Prime Minister Jawaharlal Nehru approached then-Tata Group chairman JRD Tata to start a homegrown cosmetics brand. JRD’s French-born relative Simone Tata took the brand to prominence before the group sold it to Hindustan Unilever, Unilever’s Indian subsidiary, in 1996. Today, Lakme is one of India’s most prominent cosmetics brands. The launch of Lakme in Indonesia highlights increasing efforts by Unilever to cultivate its next global brand in emerging markets. The company says its products are already sold in 190 countries and used by 2.5 billion people every day. But most of its 13 super brands — those with annual sales of one billion euros ($1.2 billion) or more, such as Axe, Dove, and Lipton, were pioneered in developed markets before spreading around the world. The company’s units in India and Indonesia serve as launch pads for this new global mission. Pureit, a water filter developed in India, became a massive hit in the country due to a lack of clean water. Unilever has since exported the product to most of Southeast Asia as well as China, which faces similar environmental challenges. In Polman’s words, “it is slowly becoming a global business”. Similarly, Citra, a skincare brand launched more than three decades ago in Indonesia, has entered India this year following Thailand and Laos. Unilever has been doing business in the two countries for more than 80 years, and its production units are considered by many as local companies. It has navigated through similar challenges like poor infrastructure and selling products to small, family-run shops, enabling them to fend off rivals like Procter & Gamble. India and Indonesia are now among Unilever’s biggest markets in Asia, raking in combined revenue of close to $8 billion every year. Emerging markets accounted for 57% of Unilever’s revenue of 52.7 billion euros ($62.9 billion) in 2016, up from 42% a decade ago. The company has said the figure will eventually reach 70%. Its high exposure to emerging markets has fueled the company’s growth in the past but this is not a one-way bet. Emerging markets have slowed in recent years amid a cooldown in consumer spending, falling currencies, and the rise of local competitors. In Indonesia, Paragon Technology & Innovation’s halal cosmetics brand Wardah has overtaken Fair & Lovely, one of Unilever’s skincare brands, according to research company Euromonitor. The last time Unilever reported a double-digit growth in emerging markets revenue was in 2012. In 2016, the figure stood at 6.5%. In order to boost sales, Unilever has been entering new markets like Myanmar, where it announced a joint venture with a local household goods maker in May. On Monday, it announced the acquisition of Carver Korea, a South Korean skincare company, for 2.27 billion euros ($2.69 billion). It is also launching locally customized varieties of well-known brands, such as Sunsilk shampoo for hijab-wearing Muslim women in Indonesia. All of this comes as Unilever is aggressively cutting costs by, for example, slimming down its portfolio. In Indonesia, the company has reduced the number of product varieties and cut the number of stock keeping units by around 20% since 2013, to around 1,000. Boosting sales of brands less known globally, like Lakme and Pureit, through exports has become a key strategy. In some respects, Unilever is still hedging its bets. In Indonesia, Lakme and Pureit are currently sold by a sister company of Unilever Indonesia, a structure that some analysts say is designed to prevent Unilever Indonesia’s costs from ballooning. The company has yet to invest in retail stores that promote the brands, such as Lakme beauty salons that are popular in India. Any decline in profit margins will come under scrutiny from investors, which have high expectations for listed companies — the stock price of both Unilever Indonesia and Hindustan Unilever trade at a premium compared to the benchmark indices in their respective countries when measured by the price-to-earnings ratio. Overall, however, the trend towards emerging markets in Asia is clear. 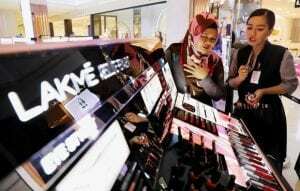 Unilever said it wants to eventually obtain halal-certification for Lakme in Indonesia, the world’s largest Muslim-majority nation, where the majority of locally-produced Unilever brands are already halal certified. Future growth of the company may hinge on the success of such efforts.